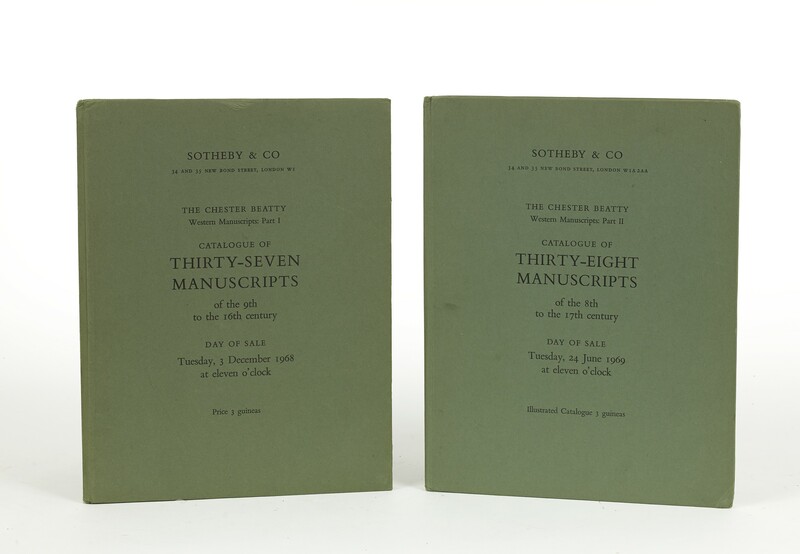 Two volumes (29 cm), I (3 December 1968): 105 (3) pp., black & white portrait-frontispiece,  colour plates, 48 black & white plates (pls.1-48). Lots numbered 1-37. II (24 June 1969): 109 (3) pp., colour frontispiece, 6 colour plates (pls.A-F), 47 black & white plates (pls.1-47). Lots numbered 38-75. 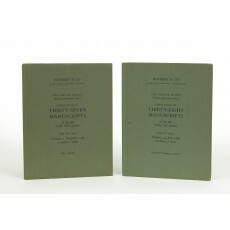 Publisher’s printed green boards. - Catalogue for a portion of the library of the American mining engineer Alfred Chester Beatty, mostly Phillipps manuscripts which he had acquired during the 1920s from Fitzroy Fenwick at Thirlestaine House (Christopher de Hamel, “Chester Beatty and the Phillipps Manuscripts” in The Book Collector, Autumn 1991, pp.358-370). ¶ Price list lacking for Part II. Attractive, unmarked copies. (29 cm), 105 (3) pp., black & white portrait-frontispiece,  colour plates, 48 plates (pls.1-48). Lots numbered 1-37. List of prices realised and buyers’ names loosely inserted. Publisher’s printed green boards. - The 37 Western illuminated manuscripts offered in the first sale realised £363,450, then a world record at auction for any sale of Western manuscripts. The highest price, £88,000, was paid by an anonymous bidder using the pseudonym “de Gourlay” for the “Speculum historiale” of Vincent de Beauvais (now Bibliothèque nationale de France, MSS NAF 15939). ¶ Fine, unmarked copy. (29 cm), 109 (3) pp., colour frontispiece, 6 colour plates (pls.A-F), 47 black & white plates (pls.1-47). Lots numbered 38-75. 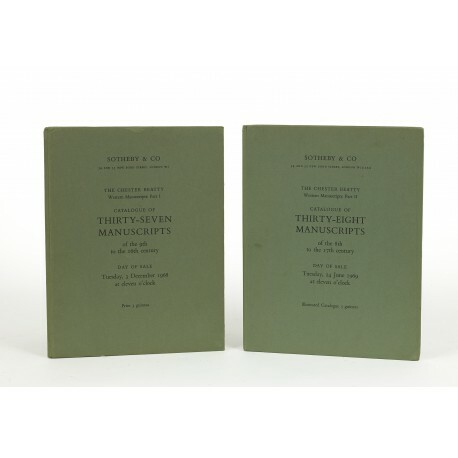 Publisher’s printed green boards. - The first four manuscripts in the second sale, all written before 900, sold above estimate: the Nonantola St Augustine, to Olschki (now Rome, Biblioteca nazionale centrale Vittorio Emanuele II, cod. 1357), £48,000; the canons of the Council of Aix-la Chapelle, to Breslauer, £19,000 (now Fondation Martin Bodmer, cod. 1348); the capitularies of the Caroline dynasty, in the recension of Ansegisus of Luxeuil Abbey, to Kraus, £24,000 (now Yale, Beinecke Library, Ms. 413); and Collectio Dionysio-Hadriana from Mainz, to Rosenthal, £12,000 (now Princeton, Scheide Library, M139). H.P. Kraus paid £85,000 for a Bible illuminated for Niccolo Albergati (H.P. Kraus, In Retrospect: 100 outstanding manuscripts sold in the last four decades, New York 1978, item 54; now Yale University, MS 407). The decorative Book of Hours of Charlotte of Savoy (1425) was sold for £40,000 to the Texas lawyer Arthur Haddaway (now Pierpont Morgan Library, MS M.1004). The sale total was £391,750. “It is unlikely, barring accidents, that material of this quality, and in this condition, will appear in the sale room again” (from a saleroom report, in The Book Collector, Autumn 1969, p.378). ¶ Fine, unmarked copy.